Well, I arrived back from Budapest yesterday and had a nice and pleasant evening with my family in London. Roast Lamb. Chips and sour cream in front of an old movie. Walking the kids to school this morning. Feel like i have been home for ages . . . But now i am shooting off to Gatwick airport for my flight to Lisbon, Portugal. Meetings all week. Dr. Jun Vencer is the main speaker. 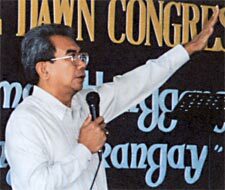 He was International Director of World Evangelical Fellowship before upgrading his calling to join the DAWN team. Yeaahhhhh. WAy to go Jun! Give up those small ambitions and put your hand to the church planting plough! When Dr. Vencer is finished talking, which is just about the time Marc Van de Woude , Andreas, myself and a few others will be coming in from the beach, drying ourselves off . . . (nahhh, just kidding – we will be taking frantic notes from Jun) then we will get up and share what God is doing among the emerging church in Europe and beyond. I am hoping my new computer will arrive by Wednesday so that I can throw some video on the wall. Lets see. Hey you prayer people – I get to speak twice on Friday, when the younger people and those interested in the emerging culture side of things show up. This is the day to rise at 3am and upload some heavy duty prayers for me and the team. No need to stand naked in freezing weather or whip yourselves into an ecstatic frenzy with branches, or anything like that, but we would appreciate you to prayer God will allow the young leaders of Portugal to rise up, find their place, and see the new churches transform their country, and pass on the redemptive gift of Portugal to the world. Thanks. Consider me off-line, silent and gone for the next 5 days. No Suddenly Seminary on Tuesday. Blessings on your week!! We’ll be praying that Dawn meetings go well. It is great to read of the increasing implementation of the church planting vision! Previous Post (p)	My computer died.